The cost of registration is a $15 flat fee. Payments are taken after registering. We will not be taking registrations or payments at the door. Registration closes January 6th at 11:59 PM PST, or earlier if we reach the 150 competitor limit. Please provide adult supervision for children under 12 years - thanks! For 3x3 One-handed and 5x5 Speedsolve: You must have a single solve under the listed cutoff time in the first two solves in order to complete the Average of 5. 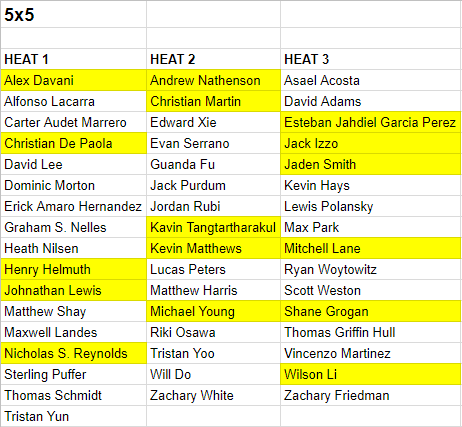 If you would like to judge, scramble, or help set up, contact us at ucsdcubing@gmail.com or leave a comment during registration. Thanks! From south of the 52: Head north on the I5, take the Gilman exit and follow Gilman Drive all the way into the UCSD campus. Just after Russell Lane, you will see the Gilman parking structure on your left. From north of the 52: Head south on I5 and take the La Jolla Village Drive exit. Make a right at La Jolla Village Drive, and in 3/4 mile turn right onto Villa La Jolla Drive. Follow it into campus and it will lead you right to the Gilman parking structure. Parking is free at UCSD on the weekends, but please park only in designated visitor parking areas, marked "P" on the campus map. Cars parked in spots marked "24/7 Reserved" may be ticketed or towed. Here is a campus map, and here is a Price Center map. After parking at Gilman parking structure, walk north on Russell Lane, left on Rupertus Lane, then right on Myers Drive. The competiton will be held in the East Ballroom on the second floor of Price Center . There will be signs posted directing toward the ballroom. Please provide adult supervision for children under 12 - thanks! 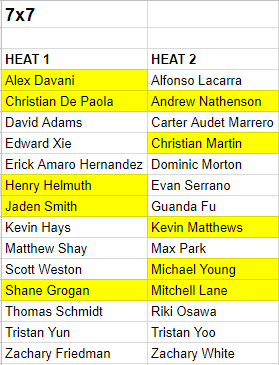 In an attempt to keep everything running smoothly, we have split competitors into "heats," as below. 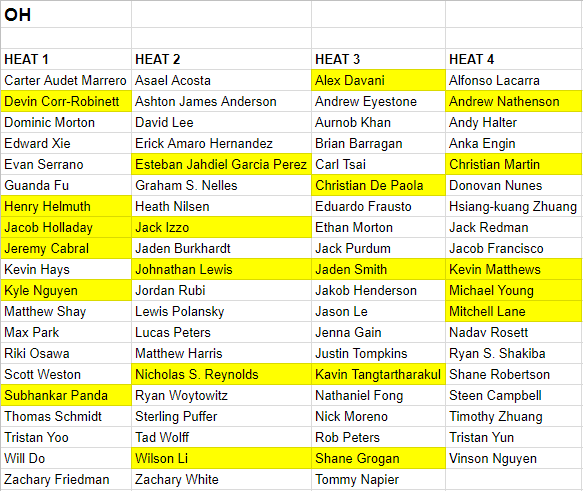 During each event, heats will be called up sequentially to solve. 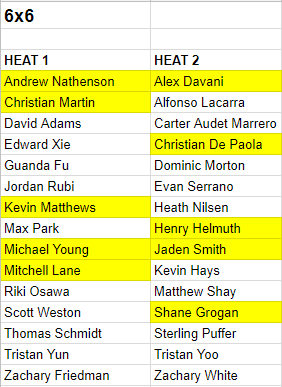 Even if you are not in heat 1 of an event, we advise you to stay close-by until your heat is called to ensure you don't miss your turn. 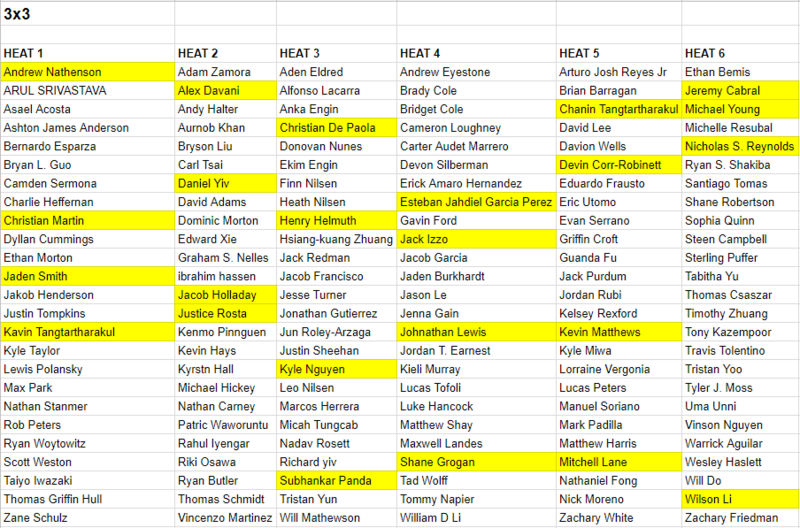 Highlighted names are our way to ensure we have volunteers evenly distributed; they can be ignored for the purpose of finding your heats.